High water (Hurst Point) 11.20 – Spring tide. On a lovely morning Duncan welcomed the group of 16 members with a special welcome to two walks newbies, Barbara and John. 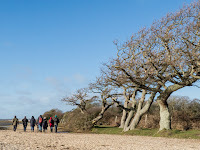 Given the state of tide and the presence of a cool south westerly wind, the leader decided that the group would set off along the Ancient Highway to the Lower Pennington Lane car park (to look over the flooded fields) then to Pennington outfall before returning to Keyhaven. Before leaving the car park we were able to enjoy good views of a female Marsh Harrier. We had a cursory look at the Balancing Pond where there were Teal, Mallard, Shoveler, Gadwall and Coot. On this stretch, a Peregrine in flight crossed the track. 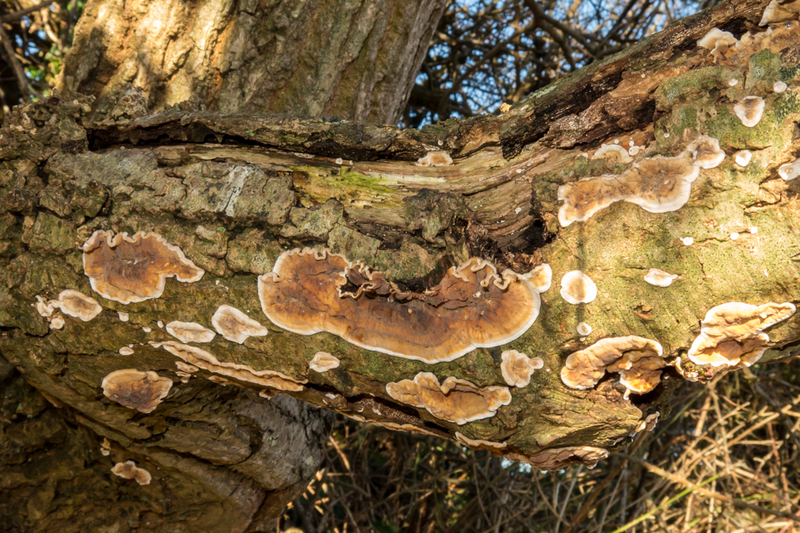 In addition, Angela identified two lichens – Oak Moss (Evernia prunastri) and Xanthoria parietina (orange/yellow/green) – sorry no English name. 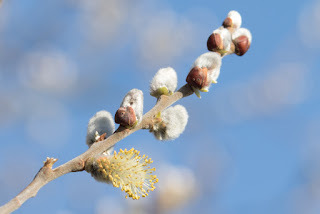 Goat Willow flowers were breaking open, but the nearby Blackthorn bushes were still in very tight bud. Also, in the ‘Efford’ field we saw four Roe Deer including one buck and three Skylarks displaying. Overlooking the flooded fields we were rewarded with hundreds of Lapwing and Golden Plover which looked stunning with the sun emphasising their colour. 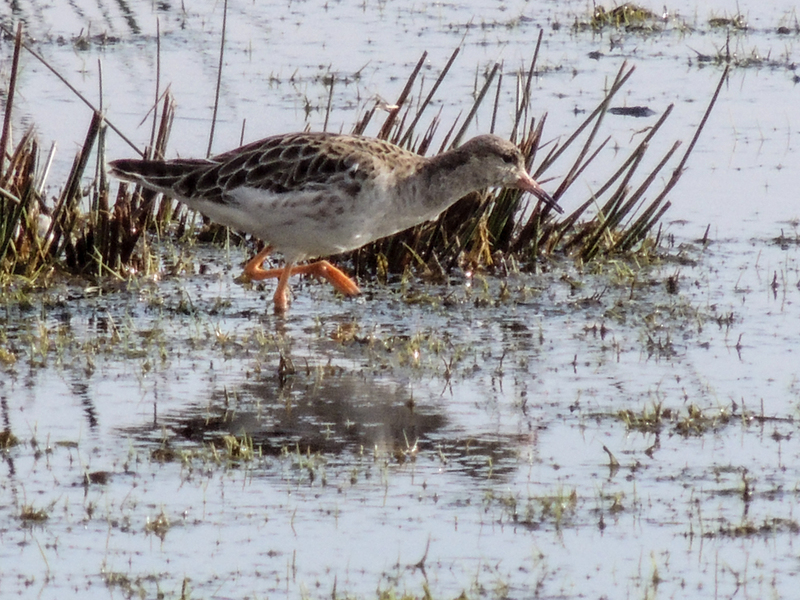 A single Ruff was also located. After a degree of clamouring from the troops, we had our mandatory biscuit stop before setting off for the sea wall and it must be reported that, again, there was a choice of dark and milk chocolate digestives! Chris forewent the biscuits, instead continuing towards the outfall. 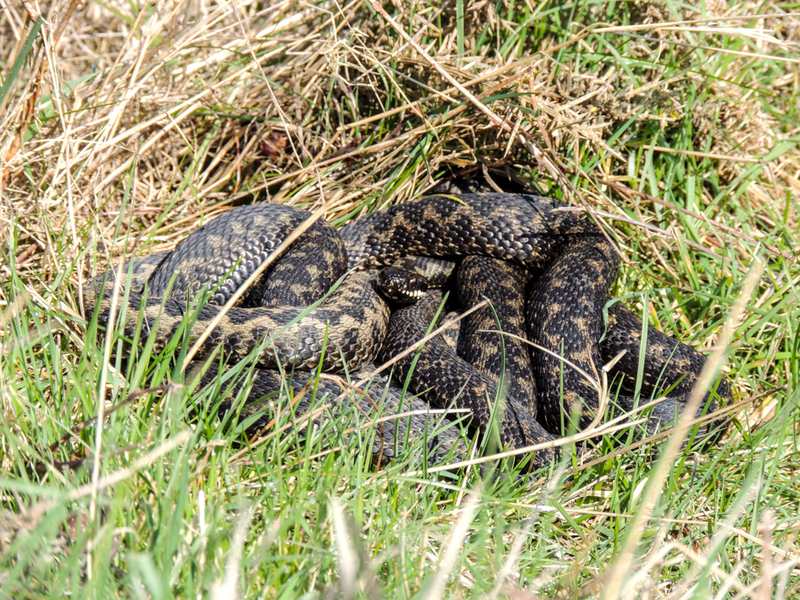 He returned several minutes later with his reward – an excellent photograph of basking adders. 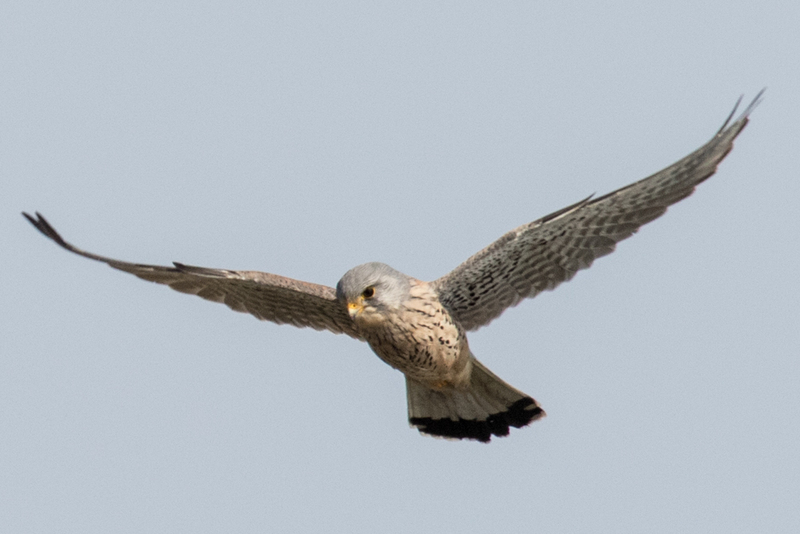 We had a really close view of a hovering male Kestrel before reaching the seawall where there was a good number of Dunlin and Turnstone. A Spotted Redshank was seen as were two Great Crested Grebes. On the walk along the seawall there were Reed Buntings, a Rock Pipit and lots of Dark-bellied Brent Geese. Particular worthy of mention are the ‘white’ Ruff on Butts Lagoon, a Chiffchaff, a quartering Marsh Harrier, the pair of Peregrines on the usual stone block, a Spoonbill on Keyhaven Lagoon, the good numbers of Pintail and Shelduck together with another significant flock of Golden Plover. We arrived back at the carpark at 13.03 and, although, one member made some crack about packed lunches and overnight accommodation being needed for this bird walk, we were privileged to have seen 55 species. Ladybirds are pretty and charming creatures but most members knew little more about them until a recent talk by Bryan Pinchen, who has written a reference book on them. There are about fifty species of ladybird in Great Britain, around half of these are tiny, the rest having spots and those were the subject of the presentation. Nearly all of these occur in the New Forest. Bryan began by explaining the life cycle starting with hibernation which is from October. The ladybirds often gather in large groups frequently in exposed sites so they can keep an even temperature to save waking up and getting cold - they can be active above 4°C but need 10°C to look for food. 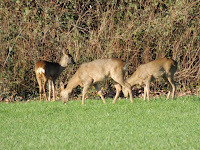 Food and mating are the priorities when they emerge in the spring. 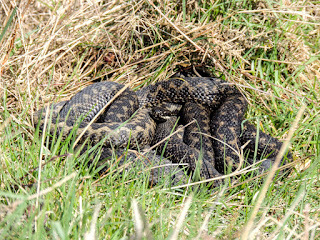 The female lays 300/400 eggs spread around: one slide showed a female eating and egg laying simultaneously - multi tasking! The female dies after egg laying but the male lives on for further mating. Most species eat aphids, a few mould or vegetation. Aphids are very prolific breeders but the ladybirds do not have it all their own way: some species of ant will milk the aphids for honeydew and perhaps unsurprisingly do their best to protect them from the ladybirds. The eggs hatch in 3-6 weeks. The larvae are about 2mm growing to approximately 5mm. At this stage they are already showing the colours of the adult and are eating 500 aphids per day! The larvae of the Scarce 7-spot ladybird are rather different, living in the nests of wood ants and eating their pupae and larvae and some aphids which also live in their nests. Far from attacking them the wood ants protect the larvae because they have picked up the distinctive wood ant smell. After 6-8 weeks the larvae pupate, often in exposed places, the pupae display colours to warn would be predators that they do not taste nice. The adults emerge July/August and feed up ahead of hibernation. Good hibernation sites will be used year on year with one generation leaving a scent which attracts next year’s ladybirds to the same spot. Different species are happy to share the same site. The hibernating ladybirds do require a period of cold weather to become sexually mature. Bryan went on to discuss identification. Ladybirds are beetles and their hardened wing cases meet in a line down the middle of their back, the wings folding neatly. Some creatures look similar such as leaf beetles (which are related) dung beetles, cockroaches, shield bugs, frog and leaf hoppers even though some of the latter are spotty and black. There are subtle structural differences between all of them and ladybirds. In this country there are only three species which are yellow with black spots and of these the Harlequin Ladybird is the most frequently seen. It arrived in this country in the year 2000 and spread very quickly along with alarm that it would be a threat to our native species since it eats anything - in practice it has not been a problem. Another species which arrived here at the same time was the Bryony Ladybird. It was not regarded as a threat since it is vegetarian; it has not been as successful as the Harlequin. The average garden will support about ten species of ladybird; twenty of the twenty-five species occur in mixed woodland and indeed many in most habitats but less on heathland and in damp areas.